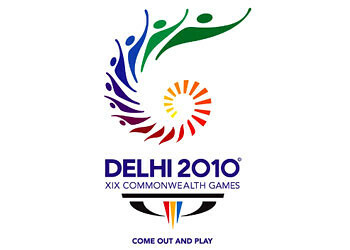 After reading about all the negative hype surrounding the Delhi Commonwealth Games, I found myself looking forward to watching the opening ceremony held last Sunday. I guess, deep down there was a part of me that hopes to see some mishaps or technical glitches that will mar the occasion, you know, like watching F1 for the crashes. So, I tuned in to TV1 at around 9 pm & was immediately greeted by the familiar deep voice of Hasbullah Awang (who else?). The Jawaharlal Nehru Stadium looked stunning basking under the glow of soft lighting. The ceremony got underway with a performance featuring drums of all shapes & sizes. 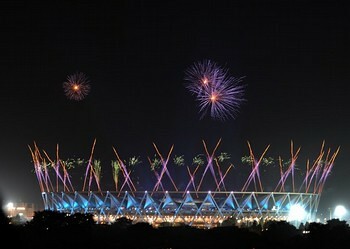 Fireworks went off & the spectators went wild....not a bad start I must say. Then came the marching in of the competing countries, all 85 of them! 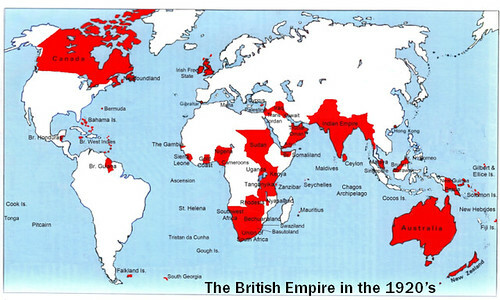 Holy Queen, how did a tiny country like Britain ruled over such a large part of the world in the past? Even more illogical is the fact that they managed to convinced their former colonies to happily participate in a sporting event held once every 4 years. Imagine asking China & South Korea to participate in a Japanese Empire Games! 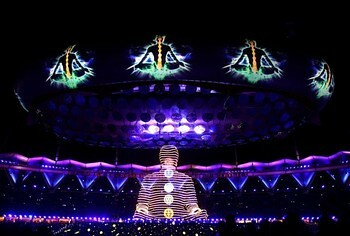 The ceremony commenced with yoga practitioners transforming the stadium into a large spiritual exercise class. This was followed by a segment called 'Indian Railways'...but just when the colourful train was making its way into the stadium, TV1 decided to end the live telecast! 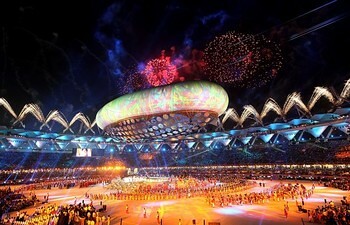 This is not the 1st time TV1 had screwed up the broadcast of the opening ceremony of a sporting event. Same thing happened during the Beijing Olympics. I think RTM secretly hates sports. Found out from the newspaper the following day that everything went smoothly till the end. No sudden mass outbreak of dengue or any invasion of cobras. 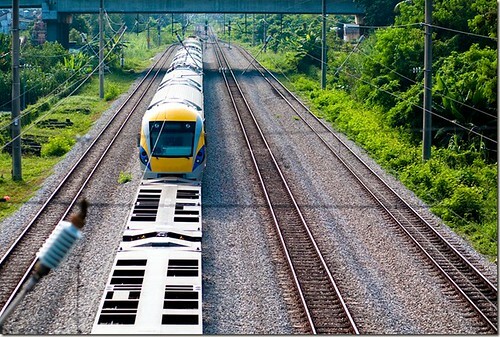 In typical Malaysian fashion, the train was still nowhere to be seen. It was suppose to arrive 12 minutes ago, at least according to the ticket that I was clutching. There was no indication of when it will be arriving. No KTM officals around or announcements whatsoever to assure the many travelers waiting at the dimly lit Platform 1 of KL Sentral station. Moments later, a policeman appeared together with a lady clad in bright yellow, asking us to stay behind the yellow line. Ahh...the train must be arriving soon. 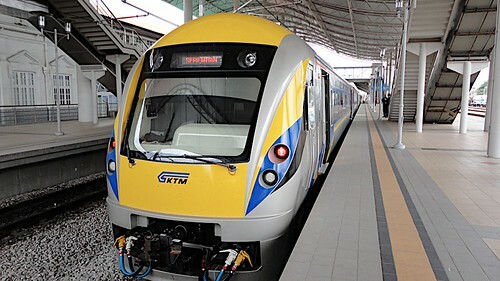 The train I was referring to is the Electric Train Service (ETS), a high speed service connecting KL-Ipoh launched with much fanfare in August after several delays. It was supposed to cut traveling time down to about 2 hours. Since I was heading to Kampar (to find Rachel), the journey will take 1 hour & 45 minutes, again...according to the information printed on my ticket. The ticket to Kampar cost RM 26, a tad expensive considering a similiar journey on the slower KTM Antarabandar only cost RM 11 for Economy seats & RM 20 for Second Class seats. 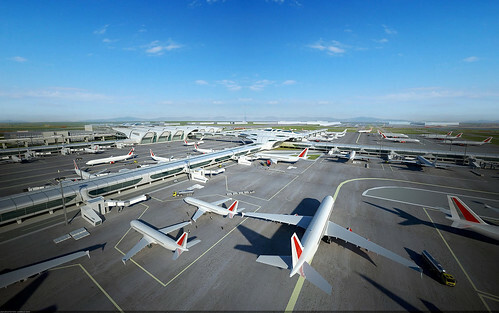 Since this is the promotional period, prices are likely to increase further in the future. The shiny 6 coach 'bullet' train came to a halt at Platform 1 & everybody promptly boarded according to their allocated coaches. In stark contrast with the romantic ambiance of the waiting area, the interior of the train was brightly lit & everything was in spanking new condition. I settled down into my seat, which was comfortable with generous legroom. The flat screen TV at the front of the coach was showing the many tourists attractions of Perak...Sam Poh Tong, Bukit Merah Water Resort, Gua Tempurung, Keris & Parang making in Kuala Kangsar etc. Strangely, I did not feel threatened even though I am Chinese. A lady emerged through the doorway with two guys following closely behind carrying trays filled with canned drinks, bottled water, sandwiches and paus. She stopped by every row to take orders & was surprisingly courteous, like a well trained air stewardess minus the thick make up. Also, the train was really starting to pick up speed. As it hit 90 km/h, a small speedometer magically appeared at the top left corner of the TV. 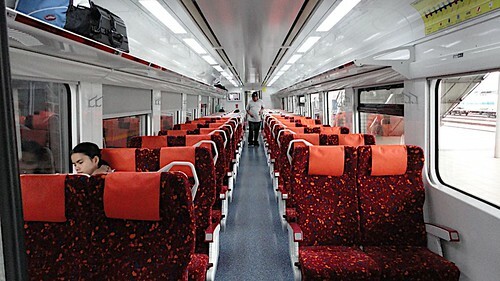 The speed of the train climbed up to more than 110 km/h at certain stretches. While at some other stretches, it had to slow down to below 90 km/h at which the speedometer will disappear, hiding itself in embarrassment. And so the cycle continued, the speedometer periodically appearing & disappearing according to the train's speed. Suddenly, the train slowed down and came to a complete halt in the middle of nowhere. It was pitch black outside. After lying motionless for almost 10 minutes, someone finally decided to clue us in on the situation. Apparently, a Komuter train was blocking the track ahead & we were just waiting for a clear stretch of railway before we can start moving again. After stopping briefly at Tanjung Malim, the train continued its journey to Kampar. With no stupid Komuter blocking its way, the train was able to unleash its full potential. This is where the train managed to hit the top speed of 155 km/h. I finally arrived at the deserted Kampar station at 9 pm, which is 30 minutes later than what was promised due to all the minor hiccups along the way. 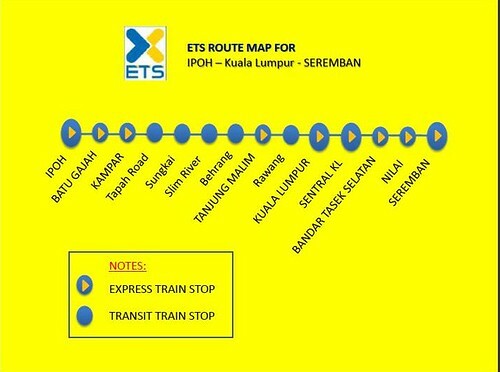 But all in all, I think the ETS is still a great way to travel if you are headed up north to Ipoh. Not exactly cheap but safe & comfortable. 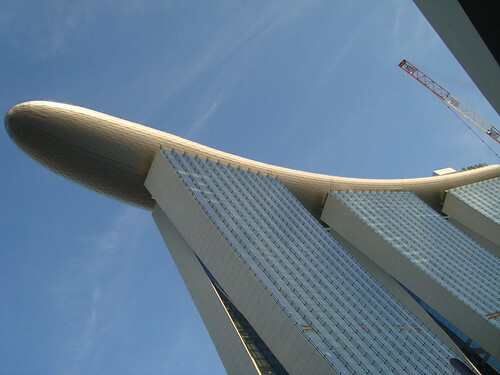 This is a continuation of Part 1, this time it's about my visit to the other casino, the Marina Bay Sands. 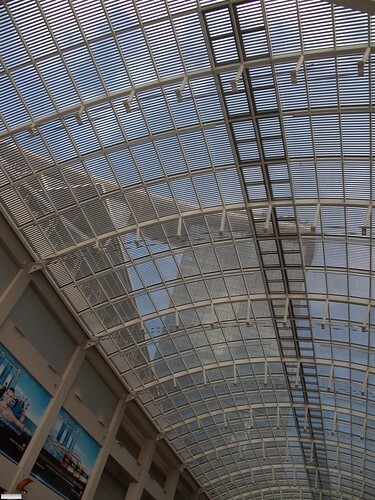 We took the MRT to the Marina Bay station before continuing our journey by foot for about 15 minutes, with the distinctive looking towers in the distance acting as our guide. I can't help but marvel at the architecture of the building as I neared it. The integrated resort itself was still very much a work in progress, construction was ongoing all around the place at a hectic pace. 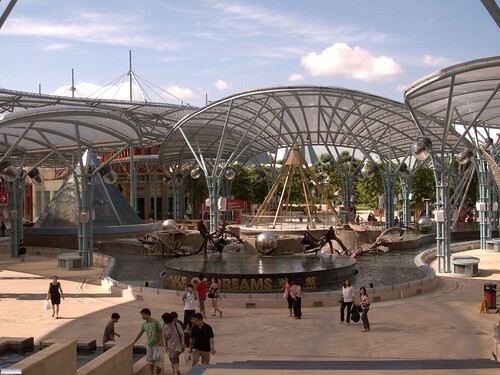 After a very enjoyable stroll aided by nice weather & gentle breeze, we arrived at the entrance of 'The Shoppes at Marina Bay'. 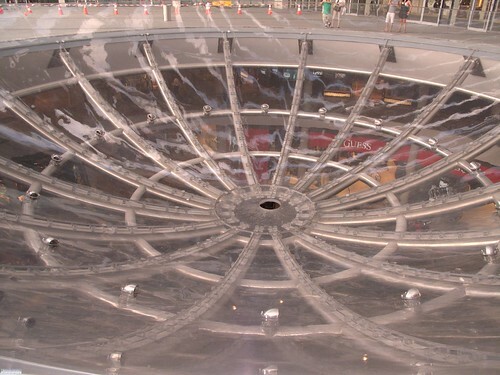 In front of it was a gigantic glass bowl with a hole in the middle, which I presumed is used to collect rain water. 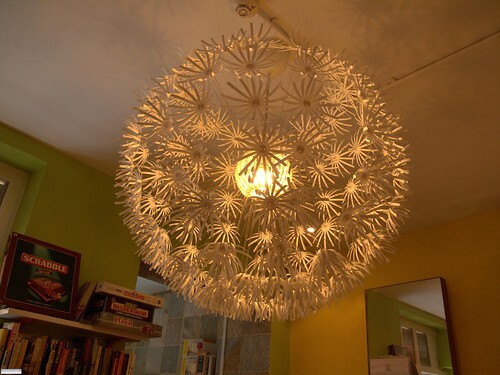 A not so subtle feng shui element incorporated into the design that I am sure needs no explanation. 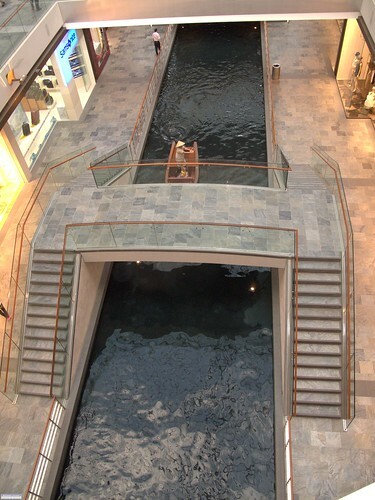 Inside the partially completed shopping mall was a man made canal, where you can experience riding a sampan rowed by a real human. This certainly reminds me of the gondola ride in Venetian, Macau. I read in a website that some of the sampan rowers are actually degree holders. Hmm...not easy to survive in Singapore even with a university's sand paper. 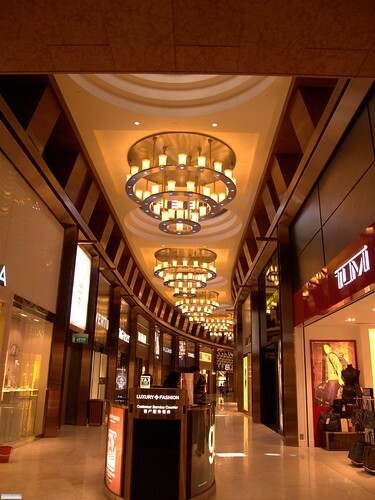 Other than that, the mall was filled with luxury brands that can only be afforded if you are really lucky at the gambling tables. Now talking about gambling, the casino is housed within the same building and has a much more discreet entrance when compared to Resorts World Sentosa. 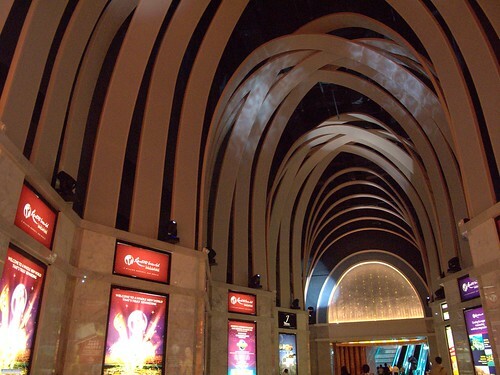 Split into multiple levels, the interior of the casino was stunning with a very high end feel to it. They had workers pushing trolleys from table to table making coffee/tea for the gamblers. If you prefer something plain instead, they will happily hand you a bottle of Marina Bay mineral water. Alas, we left without placing any bets again but not before grabbing 2 bottles of mineral water for good measure (kiasu-ness at work!). Outside, we were finally able to witness the three towers up close. It's very hard trying to fit everything into a single frame, that's why we ended up taking many senget shots like the one below. 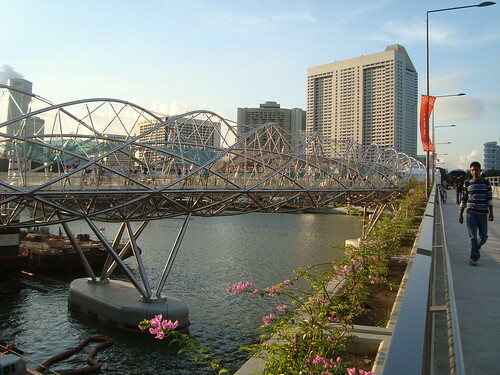 Another attraction at the Marina Bay Sands was the Helix Bridge, made to resemble the structure of a human DNA. We went back to the bridge again at night but unfortunately all the photos we took were blurry. 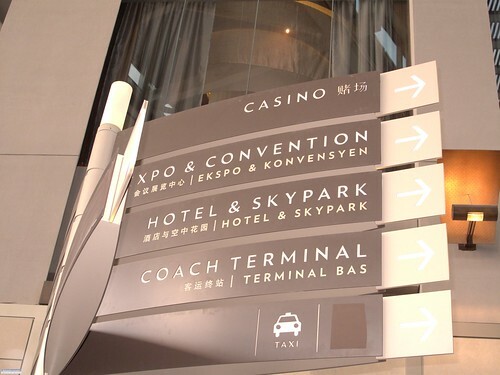 Well, this concludes my two part post about my experience at the 2 newly opened casinos in Singapore. 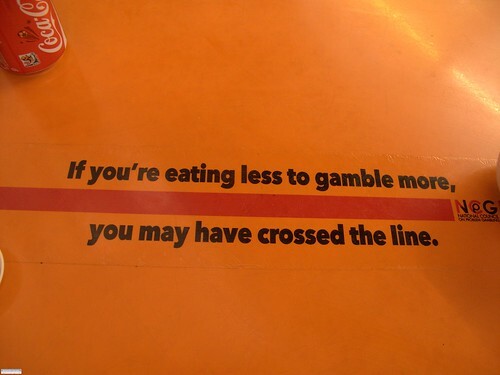 Yes, I know it's a bit anti-climatic as I did not actually gamble but I just can't bring myself to do it after seeing this while eating at Maxwell Food Centre. 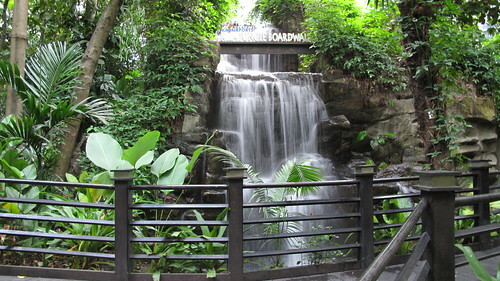 Here are some of the photos we took while exploring the sprawling ground of Resorts World Sentosa. 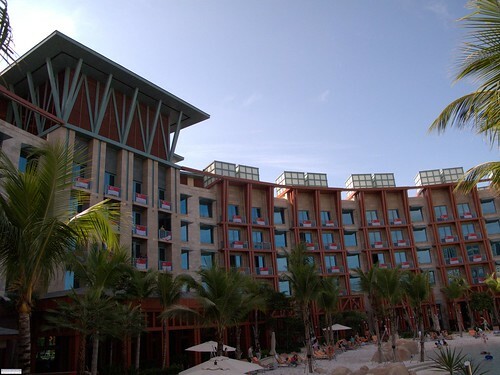 Since our visit took place close to Singapore's National Day, the resort was decorated to mark the occasion. 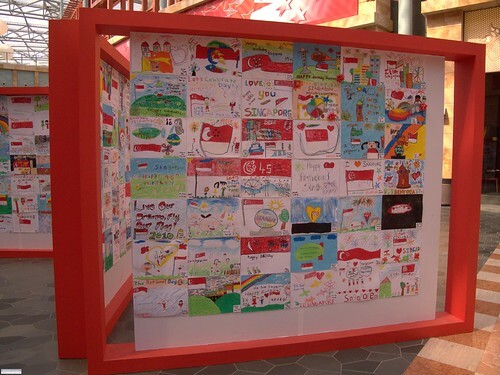 This board located not far away from the casino's entrance, displayed drawings by children celebrating the event. 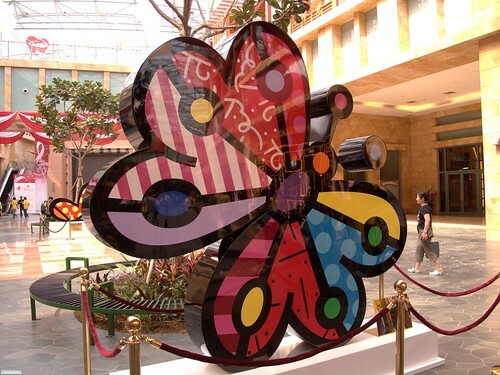 Public art installations like this colourful butterfly can be found littered around the same area. Visitors can rest their tired legs, sitting on the bench while admiring such artworks. 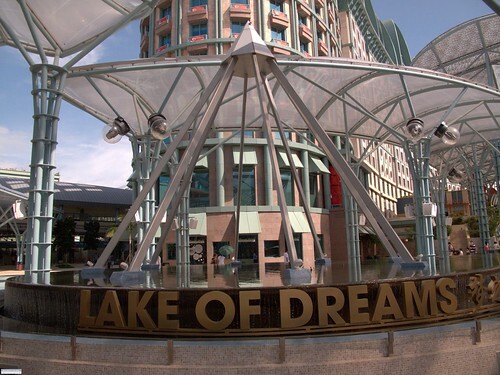 At the Festive Walk area was this large fountain called the Lake of Dreams. Here's another shot of the fountain from further away. 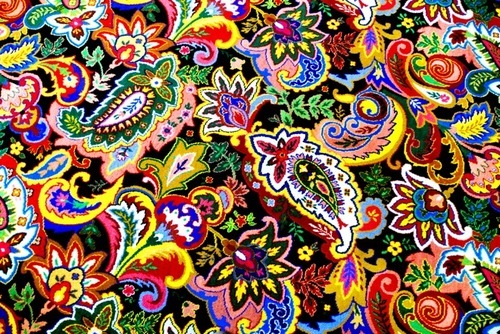 Note the many pyramids incorporated into its design. 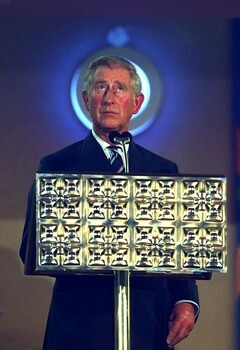 Must be the work of the Illuminati again, blatantly hiding such images in public places! Not content with making Santa Claus Hari Raya ads on TV3, they had taken over Singapore as well. 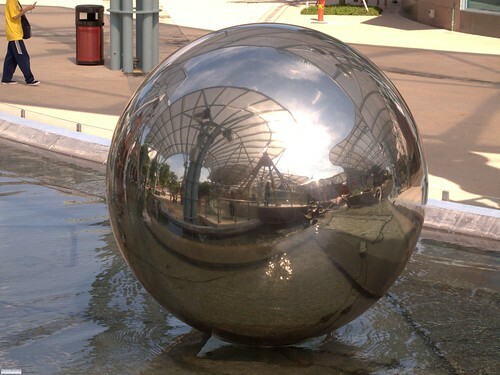 I like how the surroundings were distorted & reflected on this gigantic sphere. Also, it gives new meaning to the phrase 'balls of steel'. 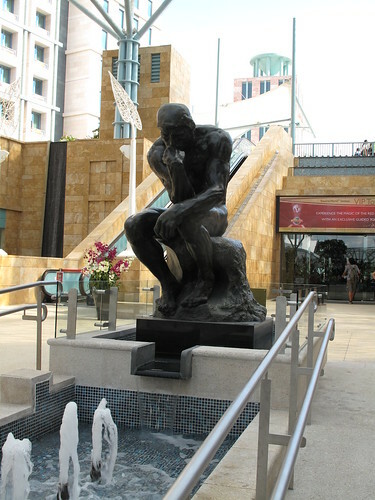 Situated further up was a reproduction of Auguste Rodin's famous sculpture, The Thinker. A man in serious thought sitting on a throne, with water gushing all around. Doesn't it reminds you of the toilet? 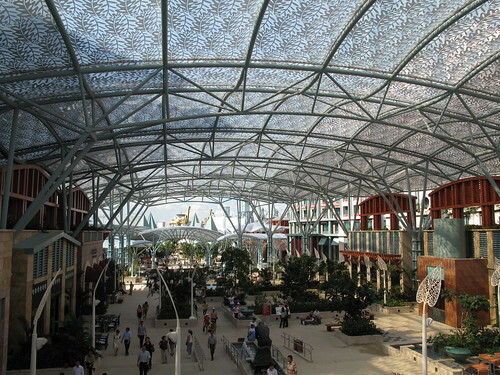 Look at the intricate patterns of the roof. 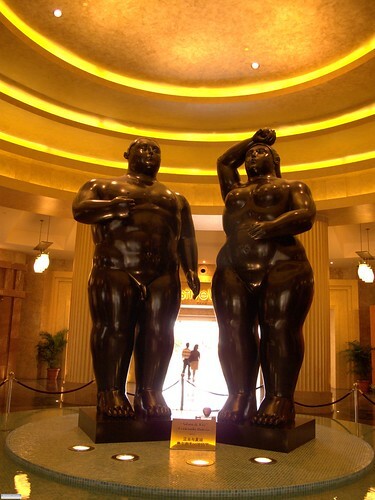 Inside one of the hotel's lobby (I had forgotten which one), we found this cute sculpture entitled 'Adam & Eve'. I think this is what Adam & Eve will end up looking like if the Garden of Eden was in America and they spend their time gorging on hamburgers instead of apples. The posh shopping area connecting the hotels. 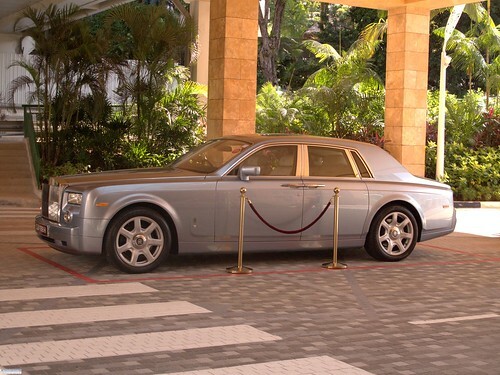 In front of the hotel lobby, we saw this majestic Rolls Royce Phantom. I have yet to see one in Malaysia. Unfortunately, the only person able to afford this, our Agong prefers to ride in a Maybach. 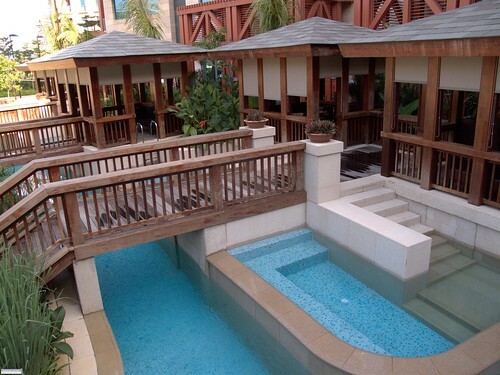 Following the signages, we arrived at the beautifully landscaped pool of Hard Rock Hotel. 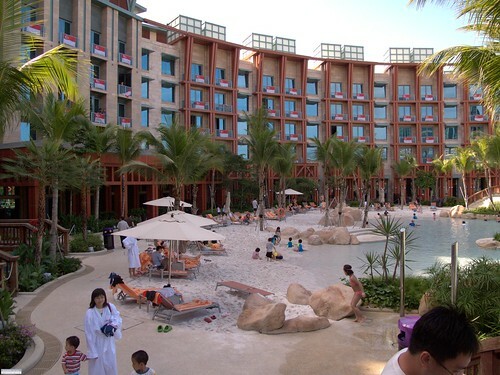 Many hotel guests were seen frolicking at the man made beach. I particularly liked this private little corner where you can soak yourself in peace, away from the screaming kids. Singaporean flags were hung from every balcony of the hotel, reminding me of similiar sights at the government flats in our country. This being a Hard Rock Hotel, there was a wall dedicated to showcase memorabilia from the stars. I was excited to see two items from one of my favourite bands of all time, Oasis. 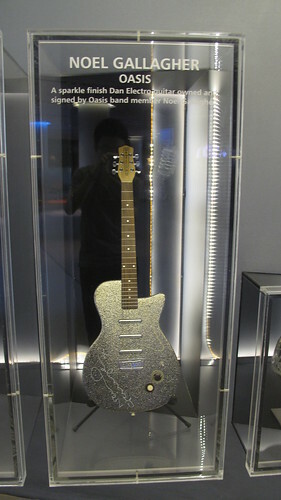 First, a sparkle finish Dan Electro guitar owned & signed by Noel Gallagher. 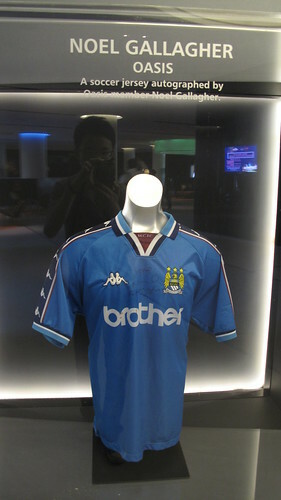 And an autographed Manchester City jersey by Noel as well. Too bad he supported the wrong side of Manchester though. 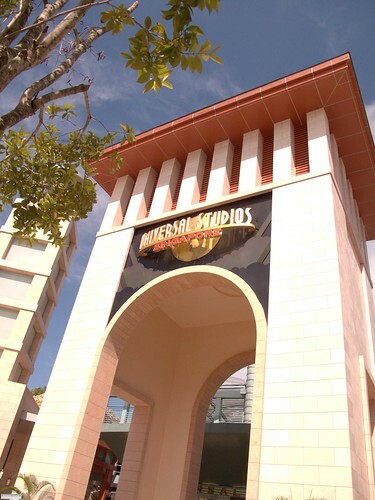 Away from the hotel, this is the grand entrance into Universal Studios Singapore. We actually went there a day early to purchase our tickets, as we heard they were sometimes sold out during peak days. We also spotted this. What? 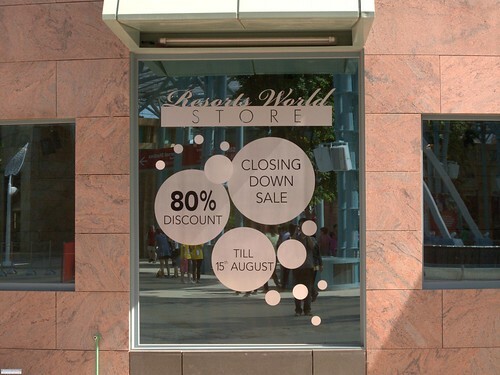 Resorts World Singapore closing down already? There aren't many things that Singapore can claim to be better than Malaysia. 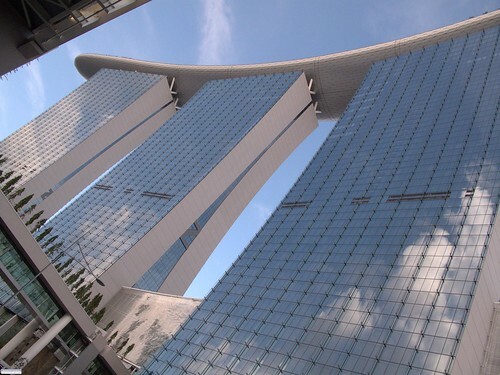 With the recent opening of 2 casinos however, Singaporeans can now boast of having an extra casino than us. I did not miss the opportunity to visit both while I was there, strictly for research purposes of course. 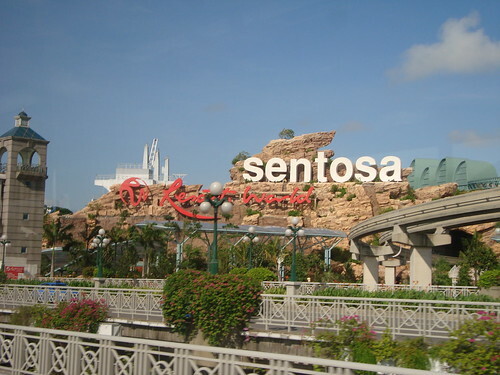 We visited Resorts World Sentosa first, by taking the RW8 bus from Vivo City. 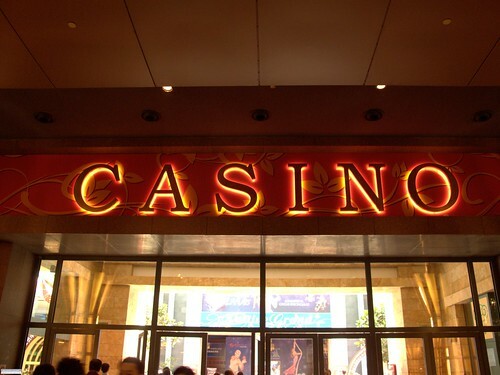 It took us directly to the entrance, the word 'CASINO' in big & shiny capital letters hanged atop it. This is a proper entrance alright...no need to keep it hidden at the top floor like in Genting Highlands. 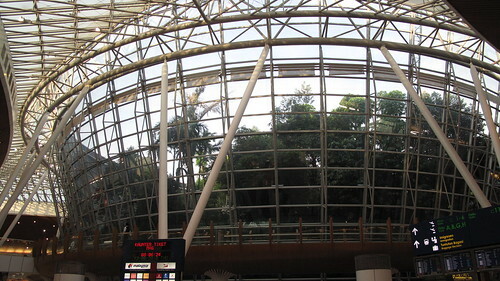 The entrance is divided into Singaporean & non-Singaporean sections. A very stern looking Chinese man stood in front it to check the passports of every tourist wanting to enter. He gave mine a long hard look before letting me in. This procedure is definitely less embarrassing than getting pull over by the police in Genting to check for IC (happened to me numerous times). While Genting had a fleet of shiny Myvis & Alza to be given away & displayed along the corridor in conjunction with our National Day. 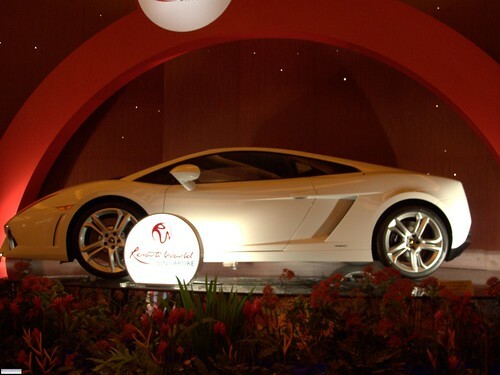 Singaporeans have to make do with a Lamborghini Gallardo due to the lack of a national car maker. Tourists were crazily snapping away at the car as cameras weren't allowed beyond that point. The casino itself was very nice, although it isn't as big as I first thought. Punters were crowded around a few tables (the others were either closed or empty), placing their bets quietly. The atmosphere is akin to a library. I grabbed a cup of drink from a waiter who was busily walking around, handing out drinks. 'Hmm...hot Chinese tea, how healthy' I thought to myself after taking a sip. Walking around exploring the place, I reached the free drinks counter which served only hot Chinese tea (again!) & plain water. 'Milo must be very expensive in Singapore'. We left the casino moments later, having to pass through the same cumbersome security checks at the exit. The new casino certainly looked impressive, but I wonder why the designers completely ignored some basic rules in casino building like having fugly carpets or not displaying the time (they had clocks inside). One uniquely Asian element remained in the design though...feng shui. Like I said in my last post about casino, I am a man of science but here are some of the alleged feng shui incorporated into the layout. 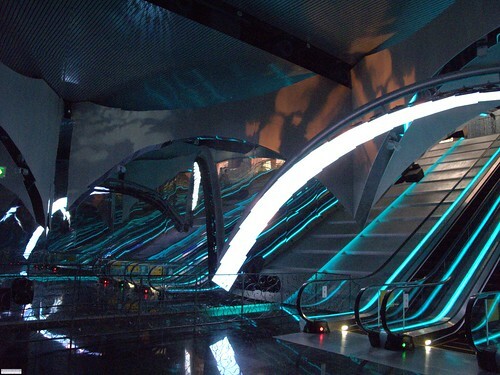 If you took the escalators from the hotel, you will have to pass through these LED screens shaped like knives to cut you into pieces. If you made it pass all of that alive, you will still be entering a casino situated at the deepest point of the resort, so you're practically entering Hell. 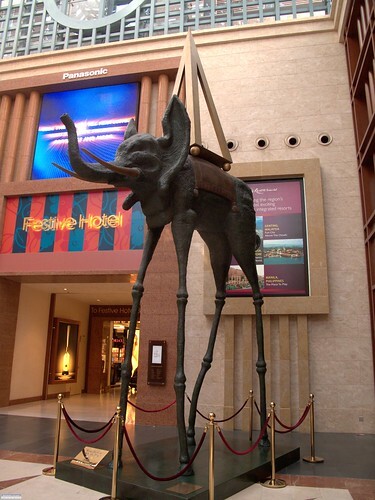 The feng shui arrangements are so powerful, even this peculiar sculpture of an elephant with a pyramid situated on top, is said to be deliberately placed to trap would be punters. Beware the money grabbing elephant! Finding cheap accommodation in Singapore is difficult, more so if you are a Malaysian with the unfavourable exchange rate. 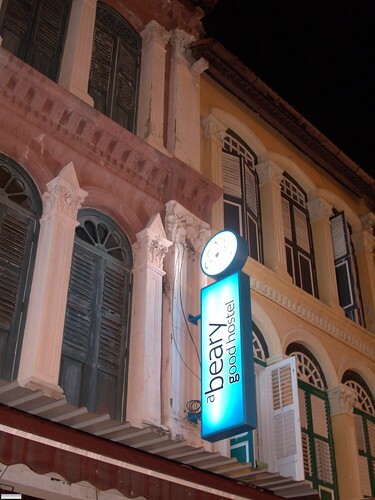 The last time me and my girlfriend went for a visit (Jan 2010), we ended up staying in the red light district of Geylang. 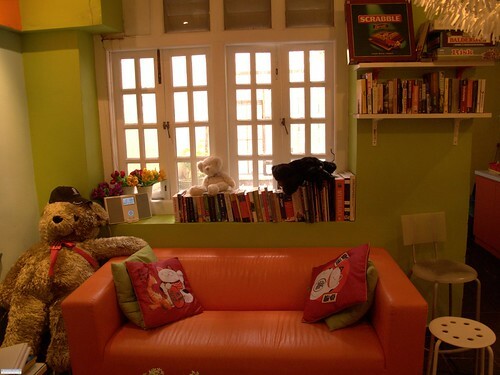 However for our most recent visit (July 2010), even the hotels in Geylang proved too expensive for our budget. The only alternative really is to look for a backpacker hostel. 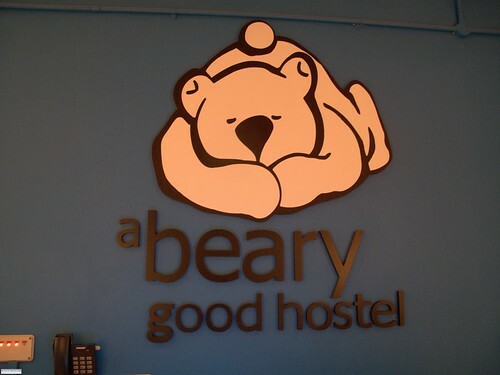 We found one such hostel, the punnily named, A Beary Good Hostel located in Chinatown. I was a bit hesitant though having never stayed in such places before. They also do not have any private rooms, meaning we have to sleep on bunk beds in a dorm full of strangers. But still, we took the plunge after reading nothing but glowing reviews of it from TripAdvisor. The relatively cheap price of $20 per night made things easier as well. Booking is done online through their website by placing a 10% deposit. They accidentally charged me double that amount though but did apologised profusely for the error. To make up for it, they threw in a couple of free drinks for us upon arrival. We got ourselves a double decker bed near the window as per our request prior to booking. 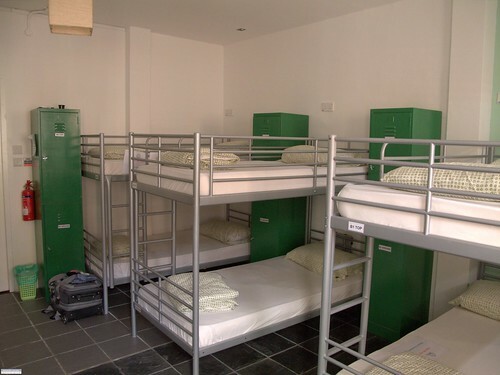 The entire room has 5 double decker beds in total and is very clean but slightly cramped due to limited space. Each occupant get their own locker but we being such amateurish backpackers did not bring our own lock, so we ended up purchasing 1 from the counter for $4. Rookie mistake. The blanket provided was quite thin but luckily the air conditioning wasn't very cold at night. During our stay, all beds were occupied, mostly by mat sallehs but we did meet a young couple from Hong Kong who traveled to Singapore together with the guy's mum. 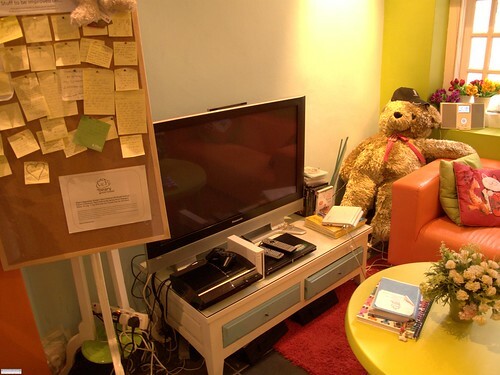 The lounge area is a cosy area with some books, DVDs, a PS3 and a Wii. However, the most popular devices by far were the 3 netbooks with Internet access, although typing on the tiny keyboard was pure torture. WiFi is also available FOC as well. Glad to report that the toilets & shower facilities were all clean too. Yeah, simple things like clean toilets impressed the heck out of us Malaysians. Breakfast is included as well, consisting of unlimited slices of plain bread & hot coffee or tea. For Malaysian travelers who insist on having some local fare in the morning, there is a huge bag of cereal clearly bought from a Tesco somewhere in Johor. Flying low cost in Malaysia usually means having to endure some slight discomfort while waiting for departure at the LCCT. However, plans are underway to construct a new mega low cost terminal (KLIA 2) that will make the current one look like a Tesco hypermart. 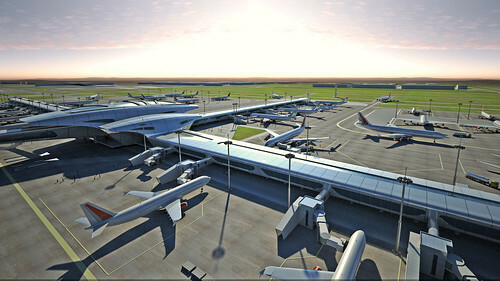 Once completed in 2012, the terminal will look something like these graphical renditions....damn cun I tell you! For our most recent trip to flood prone Singapore, we chose to fly with JetStar instead (my apologies Datuk Tony) because their fares were the cheapest around (when compared with both Air Asia & Tiger Airways). 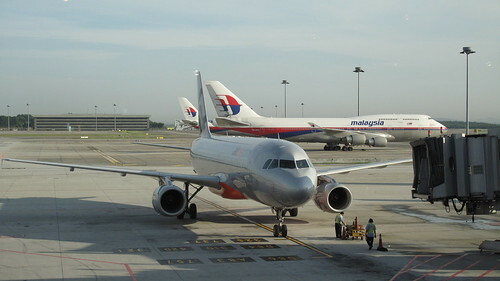 The best thing about them is that, we get to depart from KLIA. So instead of dreary surroundings, we got shiny marble floors & carpeted waiting areas. There is also a Jungle Boardwalk that will let foreign tourists & city folks like me, experience being in the heart of a tropical rainforest. 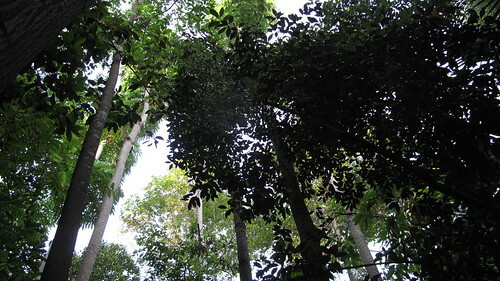 Rainforest inside an airport. Or is it the other way round? Are we really that near to the Equator? acura is the online alter ego of a disillusioned university fresh graduate. Constantly swimming with (bad) ideas, (irreverent) opinions & (evil) thoughts, often at the most inappropriate of times. This blog is his attempt to put those things into words. Note the use of the word 'attempt'. The author has been known to completely abandon his blog in the past.